I just love giving little gifts to people. At convention, it's not uncommon to make little 3-D swaps to share with friends and gain new ideas! Today the internet was down for a long time, so I decided to make a few more 3-D swaps. 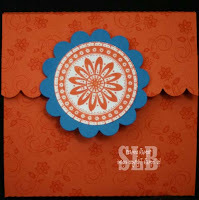 This note pad holder uses two of the new "In Colors" Tangarine Tango and Pacific Point. I love these two colors together! All items (except the note pad & Velcro dots) from Stampin' Up! Tangerine & Pacific look really great together! Love the holder!